Mia’s the new girl in school—and instead of joining a clique, she’s looking for a new way of finding friends. When Mia arrives at her new school, her motto is to be open and friendly with everyone. However, not everyone at Park Street School believes in mixing with different groups of friends. 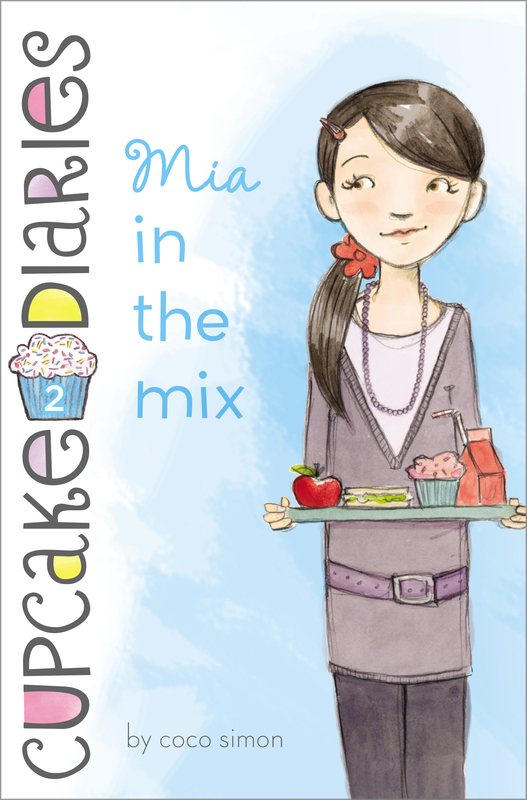 When the Popular Girls Club takes interest in Mia’s awesome fashion style and wants to recruit her, Mia has to decide between them and her great new Cupcake Club friends. It’s like choosing between her divorced mom and dad and her old house and new house. Is it always going to be Mia in the middle, or can she mix it up? My name is Mia Vélaz-Cruz, and I hate Mondays. I know, everybody says that, right? But I think I have some very compelling reasons for hating Mondays. For example, every other weekend I go to Manhattan to see my dad. My parents are divorced, and my mom and I moved out to a town in the suburbs, an hour outside the city. I really like living with my mom, but I miss my dad a lot. I miss Manhattan, too, and all of my friends there. On the weekends I visit my dad, he drives me back to my mom’s house late on Sunday nights. So it’s weird when I wake up on Monday and I realize I’m not in New York anymore. Every two weeks I wake up all confused, which is not a good way to start a Monday. Another reason I don’t like Mondays is that it’s the first day of the school week. That means five days of school until I get a day off. Five days of Mrs. Moore’s hard math quizzes. And I have to wait all the way till the end of the week for Cupcake Friday. That’s the day that either I or one of my friends brings in cupcakes to eat at lunch. That’s how we formed the Cupcake Club. But I’ll tell you more about that in a minute. Lately I’ve been looking over a bunch of journal entries, and I’ve realized that when annoying things happen, they usually happen on a Monday. Back in May, my mom told me on a Monday night that we were moving out of New York. When I ruined my new suede boots because of a sudden rainstorm, it was on a Monday. And the last time I lost my cell phone, it was Monday. And when did I find it? Friday, of course. Because Friday is an awesome day. Then there was that bad Monday I had a few weeks ago. It should have been a good Monday. A great Monday, even, because that was my first day back at school after the Cupcake Club won the contest. Remember when I mentioned Cupcake Club? I’m in the club with my friends Katie, Alexis, and Emma. It started because we all eat lunch together, and on the first day of school Katie brought in this amazing peanut-butter-and-jelly cupcake that her mom made. Katie is a fabulous cupcake baker too, and she and her mom taught us all how to make them, so we decided to form our own club and make them together. Fun, right? A little while after we formed the club, Principal LaCosta announced there was going to be a contest the day of the first school dance. There would be a big fund-raising fair in the school parking lot, and the group that raised the most funds would win a prize at the dance. We hadn’t really planned on participating in the fund-raiser, but then this other group in our class, the Popular Girls Club, kept telling everyone they were going to win. The leader of the group, Sydney, bragged that they had some “top-secret” idea that was going to blow everyone away. It’s not like we’re rivals or anything, but once we heard that, we decided to enter the contest too. Our idea was to sell cupcakes decorated with the school colors (that part was my idea). The PGC’s big secret ended up being a makeover booth, which would have been a cool idea except they weren’t very good at doing makeovers. In fact, they were terrible at it. But we were very good at baking cupcakes. We sold two hundred cupcakes and won the contest. At the dance that night, Principal LaCosta gave us our prizes: four Park Street Middle School sweatshirts. I know it’s not a huge deal or anything, but it felt really good to win. Back at my old school, things were really competitive. Just about every kid took singing lessons or art lessons or violin lessons or French lessons. Everyone was good at something. It was hard to stand out there, and I never won a prize before. I was really happy that we won. It made me think maybe it wasn’t bad that we moved out here. Just before my mom picked me up the night of our big win, Alexis had an idea. “We should all wear our sweatshirts to school on Monday,” she said. “Isn’t that kind of like bragging?” Emma asked. “Yes, definitely,” I agreed. I mean, Katie was right. We should be proud. Making two hundred cupcakes is a lot of work! Except for one problem. I don’t do sweatshirts. I’m sorry, but the last time I wore one I was five, and it made me look like a steamed dumpling. They are all lumpy and the sleeves are always too long. I told Mom about my sweatshirt issue on the drive home. Mom was right, to be honest, and I was a little surprised I hadn’t thought of it first. Our old school uniform was terrible: ugly plaid skirts with plain white, itchy tops. But you could wear a sweater or a jacket and any shoes, so you could get pretty creative with it and not look gross on a daily basis. That’s one of the good things about my new school—you can wear whatever you want. Inspired, I sat at my sewing table the next day and cut up the sweatshirt. I turned it into a cool hobo bag, the kind with a big pouch and a long strap. I added a few cool studs to the strap and around the school logo to funk it up a little. I was really proud of how it looked. On Monday morning I picked out an outfit to go with the bag: a denim skirt, a blue knit shirt with a brown leather belt around the waist, and a dark-gray-and-white-striped-blazer. I rolled up the sleeves of the blazer, then put the bag over my shoulder and checked out my reflection in the long mirror attached to my closet. Too much blue, I decided. I changed the blue shirt to a white one, then changed the belt to a braided silver belt and checked again. Better, I thought. I pulled my long black hair back into a ponytail. Maybe a headband . . . or maybe braid it to the side . . .
“Mia! You’ll be late for your bus!” Mom called from downstairs. I sighed. I’m almost always late for the bus, no matter how early I wake up. I decided to leave my hair down and hurried downstairs. Taking a bus to school is something I still need to get used to. When I went to my school in New York, I took the subway. A lot of people don’t like the subway because of how crowded it is, but I love it. I like to study the people and see what they’re wearing. Everyone has their own distinct style and things that they’re into. And there are all kinds of people on a subway—old people, moms with little kids, kids going to school like me, people from the suburbs going to work. Also, on the subway, nobody whispers about you behind your back like they do on the bus. Nobody makes loud burping noises either, like Wes Kinney does every single day in the back of the school bus, which is extremely disgusting. The best thing about the bus, though, is that my friend Katie takes it with me. That’s how we met, on the first day of school. Her best friend was supposed to ride with her, but she walked to school instead, so I asked Katie to sit with me. I felt bad for Katie, but it was lucky for me. Katie is really cool. When Katie got on the bus that morning she was wearing her Park Street sweatshirt with lightly ripped jeans and her favorite blue canvas sneakers. Her wavy brown hair was down. She has natural highlights, as if she hung out every day at the beach. If I didn’t know Katie, I would have guessed she was from California. Braaap! Wes Kinney made a big fake burp just then. His friends all started laughing. “That is so gross,” Katie said, shaking her head. This Monday was starting out okay (except for the part when I didn’t get to wear my headband). But it got annoying pretty fast in homeroom. None of my Cupcake Club friends are in my homeroom, but I do know some kids. There’s George Martinez, who’s kind of cute and really funny. He’s in my science and social studies classes too. There’s Sophie, who I like a lot. But she sits next to her best friend, Lucy, and in homeroom they’re always in a huddle, whispering to each other. Then there is Sydney Whitman and Callie Wilson. Sydney is the one who started the Popular Girls Club. Callie is in the club too, and she’s also the girl who used to be Katie’s best friend. I can see why, because she’s nice, like Katie. Katie, Alexis, and Emma all think Sydney is horrible. They say she’s always making mean comments to them. She’s never said anything really mean to me. And to be honest, I like the way she dresses. She has a really good sense of fashion, which is something we have in common. Like today, she was wearing a scoop-neck T-shirt with a floral chiffon skirt, black leggings, and an awesome wraparound belt that had a large pewter flower as the buckle. So sometimes I think, you know, that maybe we could be friends. Don’t get me wrong—the girls in the Cupcake Club are my BFFs, and I love them. But none of them are into fashion the way I am. Sydney and Callie sit right across from me. Callie gave me a smile when I sat down. “Those were great cupcakes you guys made on Saturday,” Callie told me. I thought I saw Sydney give Callie a glare. But when she turned to me, she was smiling too. “That was a really interesting dress you wore to the dance, Mia,” Sydney said. Hmm. I wasn’t sure what “interesting” meant. I had worn a minidress with black, purple, and turquoise panels, a black sequined jacket, and black patent leather peep toe flats. “Perfectly chic,” my mom had said. I knew exactly what Sydney was doing. She was insulting me, but in a “nice” way. Sort of. I know my outfit might have been a little too sophisticated for a middle school dance, but so what? I liked it. “There’s no such thing as being overdressed,” I replied calmly. “That’s what my mom taught me. She used to be an editor at Flair magazine.” Then I opened up my notebook and began to sketch. I don’t normally brag about my mother’s job like that, but I didn’t know what to say to Sydney. Sydney opened her math book and pretended to start reading. “You looked really great!” said Callie, like she was trying to make up for Sydney. I honestly didn’t really care if they liked it or not. I thought I looked good and that outfit made me feel great. I wasn’t mad at Sydney—just annoyed. Which is not a fabulous way to start the day. But what can you expect from a Monday?